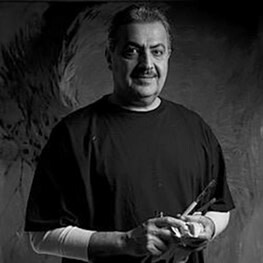 Born and bred in Bahrain, artist Rashid Al Khalifa moved to England in 1972 after being encouraged by the late Amir of Bahrain, by Shaikh Isa Al Khalifa. He studied Art and Design at Brighton and Hastings Art College. In 1975, Rashid returned to Bahrain and founded the Bahrain Art Society aiming to encourage fellow artists. Now honorary president of the Society, Rashid continues to be an avid patron of the arts and is keen to both develop and support the arts in his country. Rashid Al Khalifa has participated in a number of regional and international exhibitions including the Exhibition for Bahraini Artists, Leighton House, London, UK (1984), Le Salon des Artists Francais, Grand Palais, Paris (1984), The Cairo Biannual Art Exhibition, Cairo, Egypt (1985), the First GCC Art Exhibition, Japan (1986), Made in Bahrain, London, UK (1992), the Sharjah Biennale, Sharjah, UAE (1996, 1999), Art America, Miami, USA (1997), The UN Centre, Switzerland (1999), UNESCO (2007) and Our Bahrain, World Economic Forum, Davos, Switzerland (2007). Convex: A New Perspective, solo exhibition at the Bahrain National Museum (2010). Reflection: New work by Rashid Al Khalifa at the Bahrain Financial Harbour Art Gallery on January 2012 and traveled to Beirut Art Fair 2012 as artBahrain's solo presentation.